FANDOM UNITED is back. After collecting $2,300 last year, the project is back online again, bigger and better. 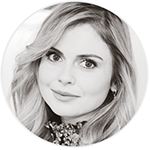 And this time, ROSEMCIVERSOURCE.NET is a part of it! We want to unite the ‘Once Upon A Time‘ Fandom and raise money in name all the cast members. This project will be shown to the cast members at Fairytales V and The Happy Ending Convention in France. Face Forward: Face Forward provides pro bono reconstructive surgery & emotional support to victims of domestic violence, human trafficking & other cruel acts of crime. Blue Cross: Sick, injured and homeless pets have relied on us since 1897. Abandoned or unwanted, ill or injured, pets turn to us for help every year. DEWC: Our mission: to provide basic needs and positive change for women and children in the Downtown Eastside of Vancouver. A few word about this magical moment who happened during the afternoon. 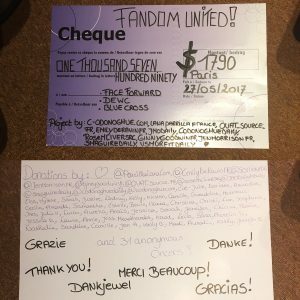 I had the immense honor of being part of the second edition of the ‘Fandom United‘. 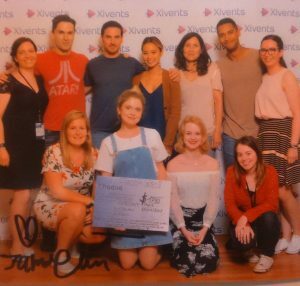 We raised money for a few charities supported by the ‘Once Upon a Time‘ actors, thanks to amazing & very generous donators. We were lucky, during the group photos, to give the check to all the actors. 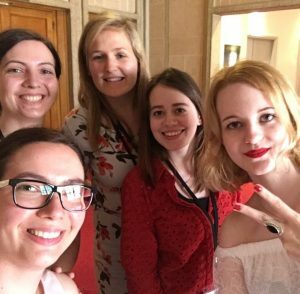 When we waited for the green light, to give them the check, Rose McIver immediately noticed it and told Colin O’Donoghue ‘Oh! What is this check ?!’. When it was time to give them, Rose immediately grabbed it on her hands and said, ‘Woow, it’s amazing! !’ She was really surprised and delighted to see what we had been able to pick up. She added that she wanted to keep it. All the actors were really delighted and it was a very beautiful moment. This year, we raised 1790$!